Our Low pressure Deck Cleaning method is designed to clear your deck of all mold, Algae, dirt that's been built up over the years and bring it back to its original look. There's Nothing better than getting out on your Deck and enjoying the beautiful weather in the summer months, but when your deck is covered in mold, algae, and other stains just from regular use it can be hard to look at. Improper care of a deck can take away years of life causing is to fall apart and need replaced which can be VERY costly. When it comes to Deck cleaning in Iowa Waterpower Solutions has the expertise for the right process. Step 1. I Clean your deck with a specially formulated cleaning product to kill all the mold, Algae, Mildew, and separate all the dirt from the wood so that is can be cleaned with "low pressure" so that no damage is caused to the wood. Step 2. I apply are brightening agent which makes the deck shine and brightens the wood. Once the Brightener is applied the deck is rinsed again. Step 3. After these steps your deck is ready to be sealed and or stained so that the wood can be protected from water, sun, dirt, spills, which can soak into the wood causing ugly stains. When a Deck is properly sealed water wont be able to get into the wood and cause damage. Using high pressure on decks will cause serious damage to the wood which can lead to costly repairs. 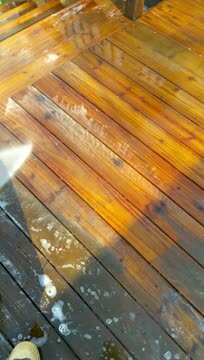 If you don't have experience using a power washer you can cause lots of damage to your deck really easy, which will end up costing you more in repairs than a professional cleaning By Waterpower Solutions. Power Washers can cut through wood with ease if not used properly. Did you get a bad Stain job or is your stain or sealer wearing away? We offer Deck Stripping Services to restore your Deck, Pergola, and other wooden structures back to their original condition. Ready To Restore and protect Your Deck? The video shows you the BEST, SAFEST, most EFFECTIVE way to clean a wooden Deck. With safe to the TOUCH LOW PRESSURE Washing. The only way we will clean a Deck.